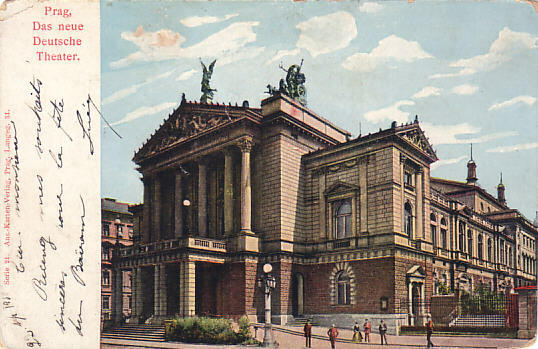 Built 1886-1887 as "Neues Deutsches Theater" [New German Theatre] for "Deutscher Theaterverein"by Ferdinand Fellner & Hermann Helmer at the site of the demolished wooden "Neustädter Sommertheater" (1859-1886). 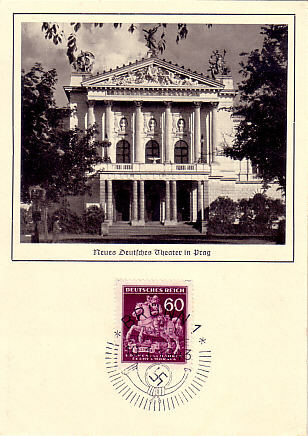 Opened 5 January 1888 with Wagner's "Die Meistersinger von Nürnberg". Partially destroyed by bombs in 1945. 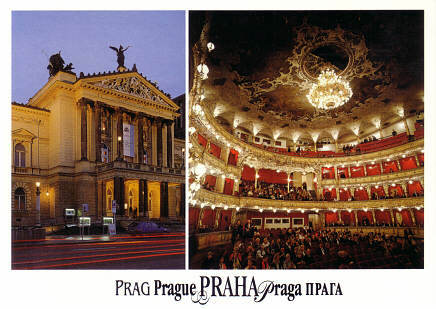 Subsequently rebuilt and re-opened as "Smetavono divadlo" in honour of the Czech composer, Bedrich Smetana (1824-1884) in 1949. 1968-1973 major renovation of the auditorium, complete modernization of the technical equipment, extension by a new administrative building. 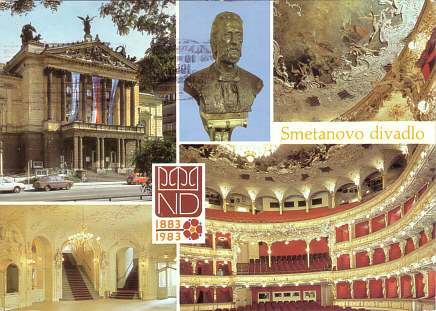 1980-1981 modernization of the stage, renovation of the auditorium. 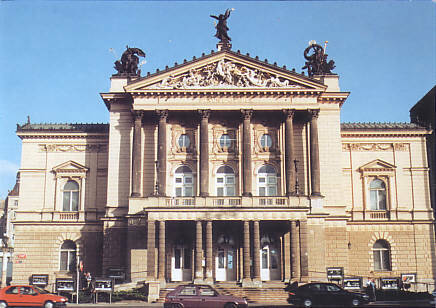 Renamed "Státní Opera" [State Opera] on 1 April 1992. Originally ca. 2200, today 1046 seats. 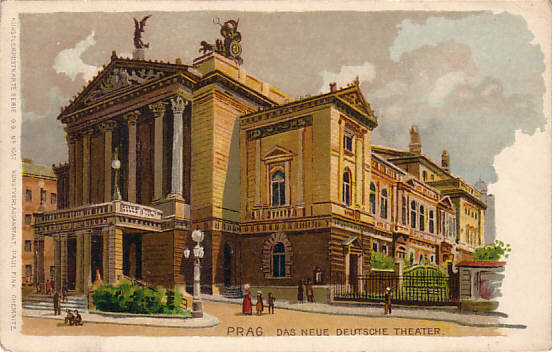 Front Text: "Prag, Das neue Deutsche Theater"
Reverse Text: "Prag, Deutsches Theater - Praha, Nemecké divadlo"
Reverse Text: "Prag, Das Neue Deutsche Tehater, 1886-1888 vom Deutschen Theaterverein nach Entwurf von Fellner und Helmer am Stadtpark in der Neustadt errichtet. 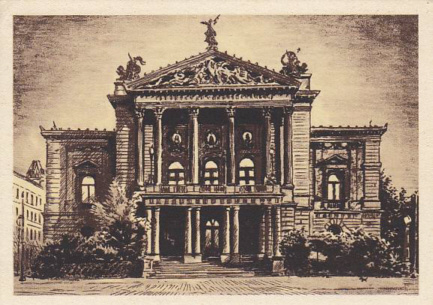 Zeichnung: Ragimund Reimesch"
Front Text: "Neues Deutsches Theater in Prag"
Front Text: "Smetanovo divadlo - N[arodní] D[ivadlo] 1883-1983"
Reverse Text: "Praha - Smetanovo divadlo, puvodne Nové nemecké divadlo. Provoz byl zahájen v r. 1888. 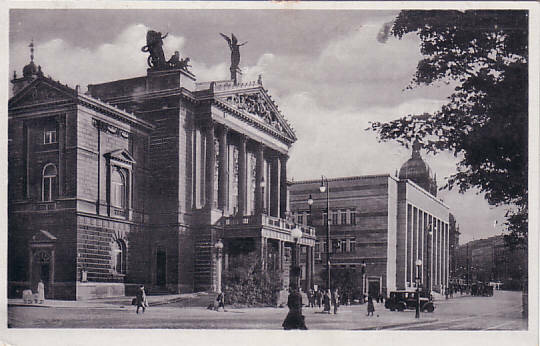 Od r. 1945 Divadlo 5. kvetna. Od r. 1948 je treti scénou Národniho divadla, na Semtanovo divadlo prejmenováno v r. 1949"
Reverse Text: "Státní Opera Praha - Intendant: Daniel Dvorak"
Front Text: "Prag Prague Praha Praga Praga"
Reverse Text: "Neorenesancní budova, Státní opery a interiér - The Neo-Renaissance building of the State Opera. 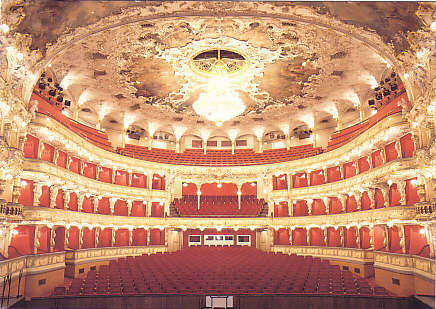 The interior of the State Opera"